← Does Budget 2016 Acknowledge That Electoral Reform Won’t Happen Before 2019? Various British MPs like Jacob Rees-Mogg and journalists like Peter Hitchens have called for an early general election in the wake of Leave’s victory in the Brexit referendum and Prime Minister Cameron’s announcement that he will resign the premiership by October. But as I shall demonstrate below, holding an early general election is no longer a routine matter because the Prime Minister can no longer make and take responsibility for the decision to dissolve parliament because of the Fixed-Term Parliaments Act, 2011. This new state of affairs in British politics and the implications of this radical and under-appreciated piece of legislation from 2011 will therefore only further complicate the fallout of the Brexit Referendum. Jacob Rees-Mogg, Conservative MP and “member for the 18th century”, and Philip Norton, a Conservative lifepeer and Professor of Government at the University of Hull, are amongst the few British parliamentarians who seem to have understood the true ramifications of the Fixed-Term Parliaments Act, 2011. They both voted against the bill in the last parliament and mounted a spirited defence of parliament’s liberties and the proper roles of the legislature and executive. Norton also explained on his blog that an early general election is no longer straight-forward and that the Prime Minister no longer makes that decision. I shall state from the outset the most radical and significant attribute of the Fixed-Term Parliaments Act, 2011: it has put the Crown’s prerogative authority over dissolution into abeyance. The Prime Minister no longer plays any role whatsoever in dissolution, and the Queen no longer promulgates dissolution into force on and in accordance with the Prime Minister’s advice. The Prime Minister of the United Kingdom can no longer call a snap election. The Queen could no longer refuse a Prime Minister’s advice to dissolve parliament under exceptional circumstances because the Prime Minister no longer gives any advice pertaining to dissolution. In short, the Fixed-Term Parliaments Act, 2011 achieves in the United Kingdom what the proponents of fixed-date election laws in Canada want and mistakenly believe has happened in Canada, at the federal level, and in the provinces that have passed similar laws (all except Nova Scotia). 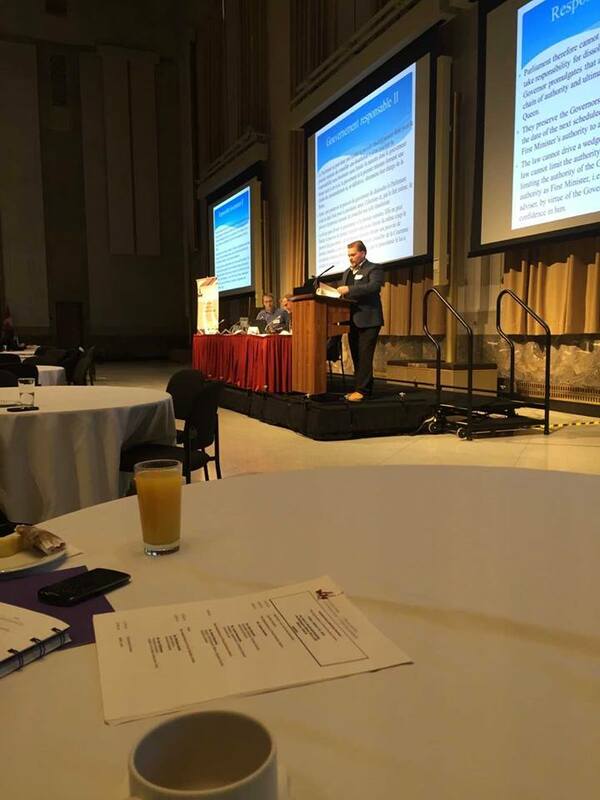 I have presented twice on the Fixed-Term Parliaments Act, 2011, most recently at the Canadian Study of Parliament Group’s seminar in January 2016. On both occasions, I got the impression that no one in my Canadian audiences had heard of the law and therefore did not appreciate its radicalism and its profound effects on the conduct of Responsible Government. During that second presentation, I was so tempted to invoke Monty Python’s Dead Parrot Sketch in order to illustrate how executive authority over dissolution is dead. It is no more. It has ceased to be. It is bereft of life. It rests in peace. It has met its maker. This is an ex-prerogative authority of the British Crown! I almost spontaneously walked into that impression during my presentation, and definitely should have run with it, too, but I pulled back from that at the last second because I had already code-swtiched into RP inadvertently elsewhere in my presentation. (Two of my close friends in the audience that day noted how I code-switched a couple of times into an RP accent but thought that few others had noticed it). Under the Fixed-Term Parliaments Act, general elections now take place every five years on the first Thursday in May. The first scheduled election occurred on 7 May 2015, in which the British Conservatives won – much to everyone’s surprise – a parliamentary majority. While the Queen used to dissolve parliament sometime within its constitutional limit of five years on the advice of the Prime Minister, this new law now ensures that parliament dissolves automatically by efflux of time, without any intervening royal proclamation. However, the law allows for some flexibility in setting the voting day; the Prime Minister may issue a statutory instrument to delay the polling day by not more than two months – but only if the Commons and Lords each pass a resolution approving of the draft of the statutory instrument beforehand. Curiously, the Act contains a non-derogation clause that preserves the Queen’s power to prorogue on the advice of the prime minister: “This Act does not affect Her Majesty’s power to prorogue Parliament.” The Act also preserves the conventional (rather than statutory) limits on the prerogative of summoning parliament. After the automatic, statutory dissolution of Parliament, Her Majesty-in-Council must issue a proclamation for the summoning of the new parliament, which would convene, by convention, within twelve days after voting day. In order to preserve the fixed term of the parliament, the law has also radically altered the Confidence Convention. If there was ever any doubt over the veracity of Jonathan Malloy has called “The Responsible Government Approach,” , the Fixed-Term Parliament Act, 2011 shows that when you consciously prune or uproot one part of an organic whole like Responsible Government, which was never designed but which instead evolved practically over time, you do in fact have to reform or destroy the system root and branch. In an organic system like Responsible Government, all components are, by definition, intertwined with one another and cannot be separated into discrete units. There is now only one method by which the British House of Commons can withdraw its confidence from the government: it must pass an explicit motion of non-confidence. This means that if the House of Commons votes against an Address in Reply to the Queen’s Speech, a major government bill, or a supply bill, it no longer automatically withdraws its confidence from the government. There is no longer any such concept in the British House of Commons. In addition, the government can no longer declare its bills matters of confidence. Furthermore, the government can no longer interpret losing a vote or losing the ability to control the conduct of business an automatic withdrawal of confidence. In the Westminster Parliament, it is no longer possible for the Commons to withdraw its confidence from the government automatically by voting against key legislation – that’s how radical the Fixed-Term Parliaments Act, 2011 truly is. Section 2 of the Fixed-Term Parliaments Act, 2011 also sets out two procedures by which Parliament may dissolve itself before the scheduled elections. The first procedure, set out in section 2(1), does not touch upon whether the Government still commands the confidence of the Commons, and the second procedure, contained in section 2(3), sets out a form of constructive non-confidence. First, Parliament could pass a motion with a two-thirds super-majority in the form, “That there shall be an early parliamentary general election.” While the dissolution itself would occur pursuant to the vote and without the involvement of the Crown, the Prime Minister would then have to advise the Queen to issue proclamations for the return of writs and the summoning of the next parliament. Second, the Commons could withdraw its confidence from the Government through a simple majority and properly worded motion, “That this House has no confidence in Her Majesty’s Government.” If an alternative Government cannot gain the support of the Commons within fourteen days through a confirmation vote on the motion, “That this House has confidence in Her Majesty’s Government,” then the Parliament dissolves automatically in order to break the impasse. The defeated government would remain in office but exercise restraint under the caretaker convention during the writ. Conclusion: Succession Crisis in the Premiership? Prime Minister Cameron spoke outside of Number 10 a few hours after Leave won the referendum. Since Cameron had supported the United Kingdom’s Remaining in the European Union, he decided that he could no longer, in good conscience, remain as Prime Minister and carry out a policy that he opposes. I will do everything I can as Prime Minister to steady the ship over the coming weeks and months, but I do not think it would be right for me to try to be the captain that steers our country to its next destination. This is not a decision I’ve taken lightly. But I do believe it’s in the national interest to have a period of stability, and then the new leadership required. There is no need for a precise timetable today, but in my view we should aim to have a new prime minister in place by the start of the Conservative Party conference in October. Delivering stability will be important, and I will continue in the post as Prime Minister with my Cabinet for the next three months. Thus far, section 2 of the Fixed-Term Parliaments Act has never been put the test, but it almost certainly will be after Cameron resigns the premiership later this year and gives way to a successor – perhaps Boris Johnson – who campaigned for Leave. This new prime minister could then invoke Article 50 of the Treaty of Lisbon and table any necessary legislation before parliament in order to promulgate the United Kingdom’s withdrawal from the European Union into force, since the referendum itself does not promulgate anything into force but merely highlights the popular will. The procedure under section 2(3) of the Fixed-Term Parliaments Act institutes European-style confirmation voting for mid-parliamentary transitions of power between one prime minister and ministry to another. It also raises significant questions that have thus far gone untested and derogates from the prerogative authority of the Crown to appoint a Prime Minister. The confirmation vote, “That this House has confidence in Her Majesty’s Government” applies after the Commons has already withdrawn its confidence from the previous government under the precisely worded motion stated above – which in turn means that the Queen would have to appoint a prime minister on and in accordance with the advice of the House of Commons. In this manner, the Fixed-Term Parliaments Act’s radicalism extends to regulating the Sovereign’s authority to appoint a Prime Minister, in addition to putting the prerogative authority over dissolution into abeyance and to codifying the old Confidence Convention out of existence. In short, whoever succeeds David Cameron – whether Boris Johnson or someone else – will not be able to hold an early general election at will, because the Fixed-Term Parliaments Act guarantees that only the House of Commons can make that decision. United Kingdom. Parliament of the United Kingdom, Fixed-Term Parliaments Act, 2011 (London: Parliamentary Copyright, 2011), 1-4. British statues normally delegate authority to an individual minister rather than to Her Majesty-in-Council, which in practice means the Cabinet acting collectively. In contrast, the Parliament of Canada normally delegates authority to the Governor-in-Council. United Kingdom. Cabinet Office, The Cabinet Manual: A Guide to Laws, Conventions and the Rules on the Operations of Government. 1st Ed. (London: Crown Copyright, October 2011): 13. United Kingdom. Parliament of the United Kingdom, Fixed-Term Parliaments Act (London: Parliamentary Copyright, 2011), 1-4. United Kingdom. Cabinet Office, The Cabinet Manual: A Guide to Laws, Conventions and the Rules on the Operations of Government. 1st Edition. (London: Crown Copyright, October 2011): 17. This entry was posted in Confidence Convention, Constitution (Conventional), Crown (Powers and Office), Dissolution, Fixed-Date Elections, Reform. Bookmark the permalink.